Convenient topical Solution is the next generation in the Advantage multi family of products. 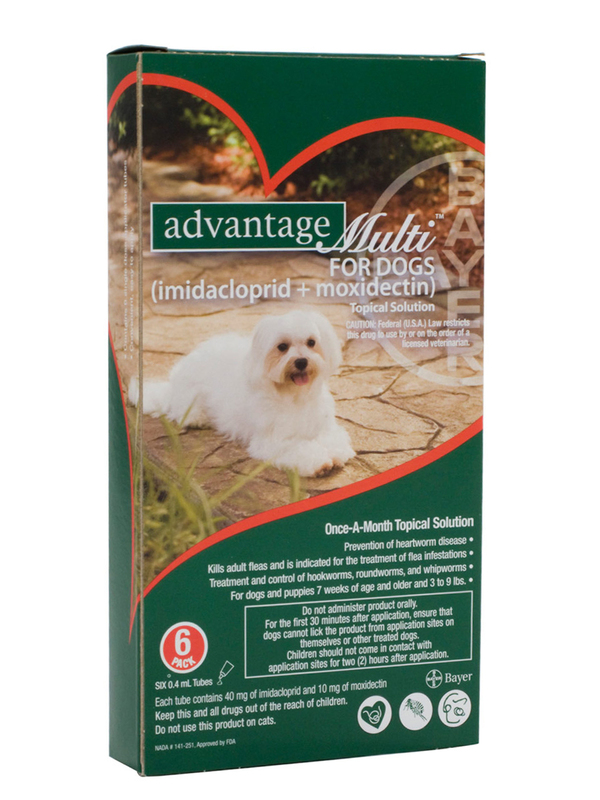 Advantage Multi is highly effective at preventing heartworm disease and treating and controlling intestinal roundworms, hookworms and whipworms all in one, easy-to-use, monthly topical solution. Possible Side Effects: Potential side effects in dogs include scratching, rubbing, or licking the application site; lethargy, decreased appetite, or hyperactivity. Consult your veterinarian if you notice any of the above side effects. A medicinal odor and residue at the application site may also be seen. If a dog ingests the product or licks the application site, serious adverse effects may occur including depression, salivation, incoordination, panting and tremors. Potential side effects in cats include lethargy and prolonged periods of sleep; behavioral changes including agitation, excessive grooming, hiding, pacing; etc. ; discomfort at the application site (rubbing, scratching, etc. ); increased salivation within 1 hour of treatment; increased drinking; or coughing. If cat licks the application site may see increased salivation, tremors, vomiting, and decreased appetite. Consult your veterinarian if you notice any of the above side effects in your pet. Hair may appear stiff, matted, oily, or damp after application. To report a possible adverse reaction to this product, contact the manufacturer (Bayer Health Care) at 1-800-422-9874. For questions, call the manufacturer at 1- 800-255-6826. If your pet experiences an allergic reaction to the medication, signs may include facial swelling, hives, scratching, sudden onset of diarrhea, vomiting, shock, seizures, pale gums, cold limbs, or coma. If you observe any of these signs, contact your veterinarian immediately. Precautions: Precautions in Animals: Not for use in animals hypersensitive (allergic) to imidacloprid or moxidectin. Do not use in animals who are sick, debilitated, or underweight. Do not use in cats under 9 weeks of age or less than 2 pounds, or in dogs under 7 weeks of age or less than 3 pounds. The safety of imidacloprid plus moxidectin in breeding, pregnant or lactating animals (female animals nursing their young) has not been determined. The safety of imidacloprid plus moxidectin in geriatric animals with potential health problems has not been determined. Do not use the dog product on cats. Do not allow any animal to lick the application site for 30 minutes. Separation of treated animals may be necessary. Consult with your veterinarian regarding the physical examinations and laboratory testing necessary prior to and during treatment with imidacloprid plus moxidectin. Human Precautions: Children should not come in contact with the application site for 30 minutes after application. Can cause eye irritation and be harmful if swallowed. Wash hands thoroughly with soap and water after handling. Drug, Food and Test Interactions: Notify your veterinarian of any other medications, including vitamins, supplements, and other flea/tick products your pet is receiving while using imidacloprid and moxidectin on your pet. Active ingredients: imidacloprid 10% and moxidectin 1%. Once-a-month dosing. Imidacloprid is a chloronicotinyl nitroguanidine insecticide. The chemical name for imidacloprid is 1-[(6-Chloro-3-pyridinyl)methyl]-N-nitro-2-imidazolidinimine. Moxidectin is a semisynthetic macrocyclic lactone endectocide derived from the actinomycete Streptomycetes cyaneogriseus noncyanogenus. The chemical name for moxidectin is [6R, 23E, 25S(E)]-5-O- Demethyl-28-deoxy-25-(1,3-dimethyl-1-butenyl)-6,28-epoxy-23-(methoxyimino) milbemycin B.